Several awards for valor are likely to be recommended for members of an ill-fated patrol in Niger that resulted in the deaths of four soldiers last October, officials with U.S. Africa Command recently told reporters at the Pentagon. 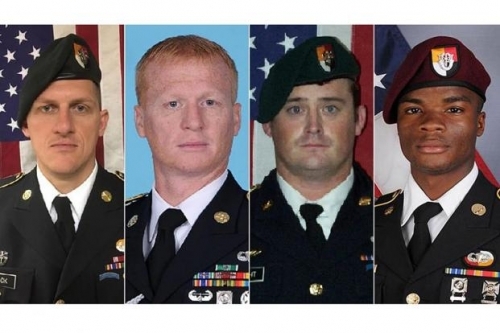 The newly released investigation into the mission found the four U.S. troops killed in the Niger ambush fought bravely but were victims of poor planning and command failures that left them outnumbered and ill-equipped for a major firefight in the African scrub. While it cited numerous things that had gone wrong in planning and execution, the investigation did not directly assign blame for the soldiers' deaths. It did, however, leave the door open for recognition of heroism. "There will be awards for valor," Marine Gen. Thomas Waldhauser, commander of U.S. Africa Command, predicted. "Numerous acts of extraordinary bravery occurred that day," said Army Maj. Gen. Roger Cloutier, Waldhauser�s chief of staff and the leader of the Article 15-6 investigation into the Niger ambush. He added that the investigation showed that one of the fallen, Sgt. La David Johnson, "died while actively engaging the enemy" from behind a thorny tree. "That's where he made his last stand; that's where he fought to the end." The investigation also singled out two Army captains -- one who commanded the patrol and a second who stayed at headquarters -- for submitting a false report on the concept of operations (CONOP) before the patrol left base. The two captains had agreed that the patrol would go on a "capture or kill" mission for a militant leader, but the CONOP they submitted to higher command was copied from a previous reconnaissance patrol designed to have little risk, the report said. From the time that the patrol left base Oct. 3 to the time of the ambush that began at about 11:30 a.m. Oct. 4, the mission of Team Ouallam, named for the base from which they operated, would change two more times, the report said. The patrol was ordered to join a raid by a separate counter-terror team, but that mission was called off because of bad weather. Team Ouallam was then directed to search a site that had been used as an enemy base. The patrol later stopped in the village of Tongo Tongo, in northwestern Niger near the Mali border, before returning to base to take on water. The attack began just outside the village, and several initial reports suggested that villagers may have colluded with the enemy force. However, Cloutier's report said, "There is insufficient evidence to determine if villagers aided the enemy or participated in the attack." The investigation said that the four troops who were killed "died with honor while actively engaging the enemy" near Tongo Tongo. "This investigation identifies individual, organizational and institutional failures and deficiencies that contributed to the tragic events," a summary of the fact-finding investigation said. However, the report concluded, "No single failure or deficiency was the sole reason for the joint patrol of 12 U.S. and about 30 Nigerien troops being ambushed by an offshoot of the Islamic State of Iraq and Syria." Killed in the fight were Sgt. La David Johnson, 25, of Miami Gardens, Florida; Staff Sgt. Bryan C. Black, 35, of Puyallup, Washington; Staff Sgt. Jeremiah W. Johnson, 39, of Springboro, Ohio; and Staff Sgt. Dustin M. Wright, 29, of Lyons, Georgia. Prior to the briefing, the military released an animated video of the ambush that showed Sgt. La David Johnson repeatedly returned fire at the enemy and volunteered to go to the rescue of others during the firefight. At one point, Johnson and two Nigerien troops pressed forward to gain better firing positions. The two Nigerien troops were killed by enemy small-arms fire as Johnson moved behind a thorny tree for cover. He was killed there by enemy small-arms fire. His body was not recovered until two days after the attack. Cloutier's report listed a series of questionable command and planning decisions that resulted in the patrol being isolated and without air cover or nearby ground backup, but he made no recommendations on disciplinary action. Waldhauser said the ultimate responsibility is his. "I take ownership for all activities" that led to the ambush, he said. "The responsibility is mine." However, Waldhauser and Cloutier said final decisions on whether to take disciplinary action or proceed to court-martial against any individuals, including superior commanders, would be left to Special Operations Command and the Department of the Army. The ambush exposed discrepancies between what Congress and even the high command were being told about the mission in Niger and what was happening on the ground that resulted in the most deadly combat loss of the Trump administration. About three weeks after the ambush, Joint Chiefs Chairman Gen. Joseph Dunford said at a Pentagon briefing that he had been told the patrol was a simple reconnaissance and training mission that posed little risk in a relatively peaceful area. However, the United Nations had reported that there had been 46 attacks in the general area of Tongo Tongo in 2017 prior to the ambush. Three days after the ambush, Nigerien officials reported that 13 gendarmes had been killed about 25 miles south of Tongo Tongo by tribal fighters crossing from Mali. Waldhauser said the investigation found that, "Yes, it was a dangerous area" and the enemy achieved "total tactical surprise." Dunford said that the patrol's commander did not call for air support until about an hour after the firefight began. "It's important to note when they didn't ask for support for that first hour, my judgment would be that that unit thought they could handle the situation without additional support," he said. Cloutier's investigation reached a similar conclusion. Initially, "they believed it was a small enemy force they could handle," he said. The fight began at about 11:35 a.m. on the morning of Oct. 4 only about 100 meters south of Tongo Tongo as the patrol convoy was returning to base 120 miles to the south, Cloutier said. The enemy force attacking from the east hit rear elements of the convoy with small-arms fire. The fight picked up in intensity as enemy fighters on motorcycles rushed to the scene, Cloutier said. The first air support for the patrol arrived about 90 minutes after the fight began, in the form of an unarmed reconnaissance drone, he said. French Mirage fighters operating out of Mali later came in at "tree-top" level and were successful in driving off some enemy fighters, although they did not drop any munitions, Cloutier said. Medevac helicopters did not arrive until five hours and 43 minutes after the attack began, he added. Robert Karem, the assistant secretary of defense for National Security Affairs, joined with Waldhauser and Cloutier in stressing the need to put new emphasis on the non-combat mission of the 800 U.S. troops in Niger. Karem said that the Special Forces constitute a small portion of the total of 800 troops and "none of these special operations forces are intended to be in combat operations." They had the right to self-defense, but their mission was to work "by, with and through" partnered Nigerien forces and to stay back in a supporting role if attacked, he added. Waldhauser said that AFRICOM is now focusing on stressing that support role to troops in Niger. "We are now far more prudent in our missions," he said. Cloutier said his report was 3,600 pages long, but the Pentagon released only an eight-page summary. He said his investigative team interviewed 143 witnesses, including 37 American and Nigerien survivors of the attack, Tongo Tongo villagers and others, but none of those witness statements was included in the summary. The investigative report had been due to be completed in January but underwent lengthy reviews through the chain of command and at the Pentagon that delayed the release. The families of the fallen have been briefed extensively on the findings and Congress has received the full report. Waldhauser indicated that more excerpts would be released to the public at a later date. Despite the length of his report, Cloutier said, "There are things about 4 October that we'll never be able to effectively convey" on the efforts of the patrol to fend off an enemy force that outnumbered them more than 3 to 1. "I cannot overstate the courage" with which Team Ouallam fought back, he said. Arnold Wright, the father of Staff Sgt. Wright, said the briefing he was given by the military suggested that the "team leader, the captain, that he mischaracterized the mission" to superiors as a routine patrol and concealed the plan to go after Doundou Chefou, a militant suspected in the kidnapping of an American aid worker. The father of Staff Sgt. Black declined to assign blame, telling National Public Radio, "I would not personally characterize them as mistakes. They were just decisions based on what they knew, and I believe that those decisions were sound decisions."